Thank you to everyone who joined us at Millenium Park for our 2nd annual Earth Day Celebration! Presenters included representatives from Citizens Climate Lobby, Lake County Audobon Society, and ComEd. Thank you to the Daily Herald for their coverage of the event! 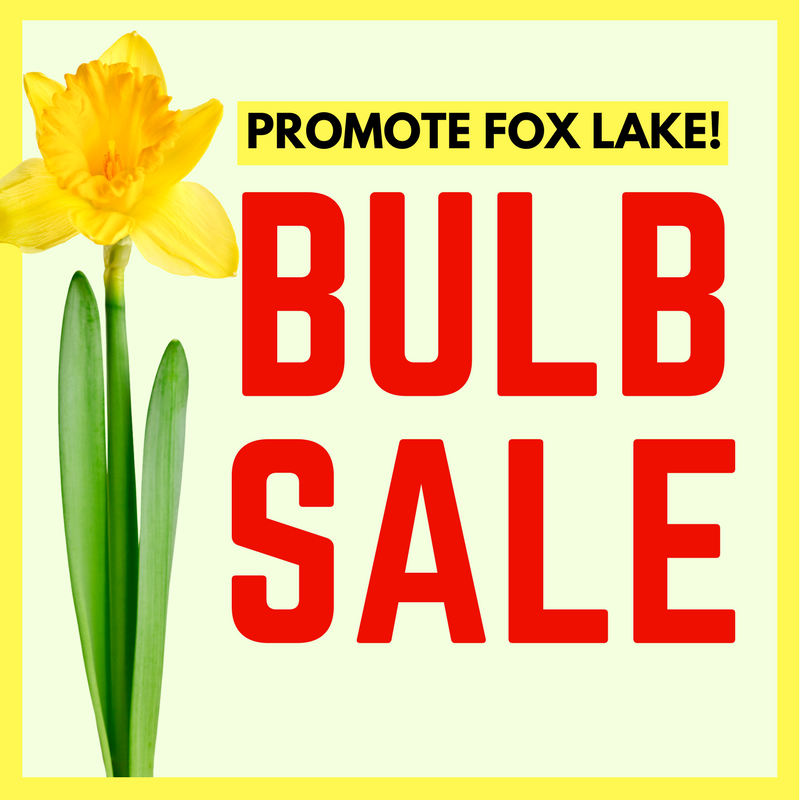 In 2017, dozens of Promote Fox Lake volunteers planted THOUSANDS of Daffodil bulbs throughout Fox Lake! We are excited to FINALLY see them greeting us in 2018!! Hundreds of Daffodil babies are showing their faces along the Rollins Rd. bike path and several other locations in Fox Lake! PROMOTE FOX LAKE, a not-for-profit corporation whose mission is to “facilitate the promotion of the Village of Fox Lake and the surrounding area, its businesses and the quality of life” is seeking volunteers to serve on the Board of Directors. There are one and two-year terms open. The group meets monthly to coordinate fundraising projects and enhancements to the Village. If you are interested or would like more information, please call the President, Michael Lescher, at 847-207-1788 or by e-mail at Michael@Lescher.com. The election will take place at the January 11th meeting. Lynn Catherine’s Deli, Café & Tavern, 32 E. Grand Ave.
Music provided by Michael Lescher on Piano! Munchies provided & raffles. It is our main source of income to support what we do! Raffle tickets are available in advance for $10 each or 3 for $20. Only 250 tickets will be sold. Winner need not be present to win. See Promote Fox Lake Committee members for tickets: Michael Lescher Kim Kiesgen, Jeri Barr, Sherry Doyle, Kathleen Skoli or Ryan Street. Promote Fox Lake is at it again! Our newest project… blanketing the Village with DAFFODILS! This September 2017, our PFL Committee will be planting 3000 daffodils bulbs in downtown Fox Lake and we need your help! A handful of local businesses and organizations have already started donating to the project, but PFL is in need of additional monetary support to make this a successful event. The committee envisions the Village’s roadsides and downtown to be blooming with daffodils this coming Spring, thanks to wonderful supporters like you! A great way to help us fund raise is to shop at www.bloominbucks.com, click our name (Promote Fox Lake), and we will receive a percentage of each sale! Volunteers need to bring garden gloves, wear appropriate clothing and BYO drinks and snacks. This year’s Spring Cleanup was a huge success. Participation by dozens of the Grant High School Track team members as well as other volunteers we were able to clean the roadsides from Home Depot to Moretti’s Restaurant and even send groups to the train station, the Lakefront Park and along Rollins Road from Millennium Park to Sayton Rd. over 50 bags of trash were collected and left for the Department of Transportation to dispose of. The semi-annual event will happen again in the Fall and all volunteers are welcomed. We thank the American Legion Auxiliary for ‘feeding the troops’. Fox Lake never looked so clean. Promote Fox Lake, the not-for-profit group working to enhance the Village sponsored the First Annual Earth Day Gathering at Millenium Park. After a welcome from organizer Danice Moore and Mayor Donny Schmit the crowd was treated to some great information on several environmental topics by speakers David Lace of the Citizens Climate Lobby, Sandy Miller of the Wild One’s Lake to Prairie Chapter and Meredith Schnelle, Long Time Environmental Activist. Entertainment was provided by Mallory Lennon and Michael Lescher and a wonderful treat table was stocked with donations from the Whistle Stop Café, Diamond Deli, Fracheschi’s, Dog & Suds, Max Lescher and Danice Moore. The climax of the Gathering was a parade of 50 volunteers down the bike path. With seeds donated by Home Depot and signs donated by Sign Appeal, you’ll see the first section of our Wildflower Garden that will be expanded every year along until the entire bike path is bordered by flowers and native plants.